At every term we welcome a few international students at Ry Højskole. Being from any part of the world, these students share the wish to become familiar with the Danish language and culture. Some international students have Danish relatives; some have been studying Danish in their homeland. As an international student at Ry Højskole you will follow a course in ‘Danish for foreigners’. You will learn how to speak, write and pronounce Danish. You will learn about our culture and society from the texts you read and from everyday life. It is required that you speak and understand English well enough to participate in social life with the other students. Apart from ‘Danish for foreigners’ all courses are taught in Danish but teachers and students will help translating instructions and information into English. 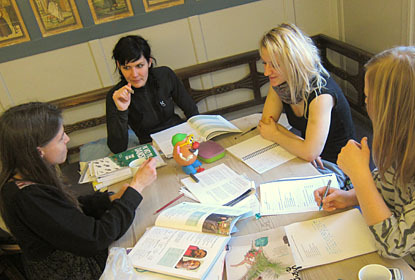 By learning Danish you will soon become an integrated student. Please write a letter to kontoret@ryhojskole.dk if you have questions, we are happy to answer you.